One of the most complicated processes in determining the right floor cleaning Service Company to hire is understanding which company will perform according to the Scope of Work and have the management expertise to accomplish your goals as a partner. This takes some investigative work. In the past 15 years, on-line auction bidding has been popular in the commercial market place for purchasing products and services including floor cleaning services. The design and purpose of this article is to provide our commercial visitors with an example of a floor cleaning service Request for Proposal which is commonly referred to as a RFP. The example below provides comprehensive information. We elected to provide a robust example so that it would be of use to all commercial users from those companies’ with multiple locations covering large geographical areas to those with one commercial building. The example can be customized to your individual needs and adjusted with additional questions to better fit our reader’s objectives. A comprehensive RFP will assist in gathering the information necessary to making the correct decision which will result in more control of your floor cleaning service budget, reduce over cost and deliver positive results. But a good RFP is only a part of the decision-making process. A thorough Scope of Work is also critical and has been outlined in a prior article. 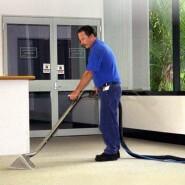 Please review this article (Floor Cleaning Service – Bidding to Save Money by Outlining Scope of Work – Commercial). A Request for Proposal (RFP) can be presented to prospective vendors several ways including as an on-line auction, a website workbooks or in hard copy. The choice is up to the individual company. If Green cleaning meets your goals for floor cleaning services, add it to the example below. Green is a movement that is on the upward swing and we are predicting green cleaning will become the preferred choice of floor cleaning within the next 10 to 12 years.